If your PC came pre-installed with Windows 7 or an earlier version, the product key is printed on a metal plate on the back or bottom of the computer. But that’s not the case if your PC came with Windows 8 or 8.1. PC manufacturers now embed the Windows 8 product key into the BIOS/UEFI firmware on the motherboard. Here I’m going to show you how to find Windows 8 product key for a pre-installed computer. This method also works even if you’ve formatted your hard drive. How to Find Windows 8 Product Key for Pre-installed Computer? Download the KeyFinder Plus program and save it to the desktop of your PC. After the download is complete, double-click the setup file to install it. 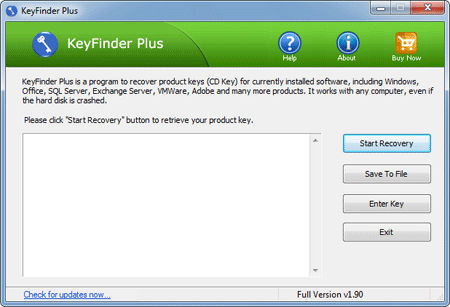 Launch the KeyFinder Plus program and Click on Start Recovery button. Select “From current system” from the drop-down menu. The program begins to read the BIOS/UEFI firmware and extract the embedded Windows 8 OEM product key, and also scan the Windows registry and find CD keys for current Windows installation, Office and other commercial softwares installed on your computer. After recovering, click on Save To File button and you can export the recovered product keys to a text file for safe keeping. I’ve tested it on several Windows 8 pre-installed machine and have confirmed that the product key retrieved within the tool is accurate.